Situated 965km (600 mi) off the coast of Ecuador, the Galápagos Islands is an isolated haven of biodiversity that remains nature’s greatest science laboratory, home to a dazzling array of reptiles, fish, mammals and birds unlike anywhere else on our planet. Today, there are over 58 species of birds residing in the Galápagos—of which 28 are endemic—making bird-watching in the archipelago some of the best in the world. Leave your telephoto lens at home; here you’ll walk among birds liked the waved albatross and observe the Galapágos hawk at close range. Here are four can’t-miss birds you just won’t find anywhere else. 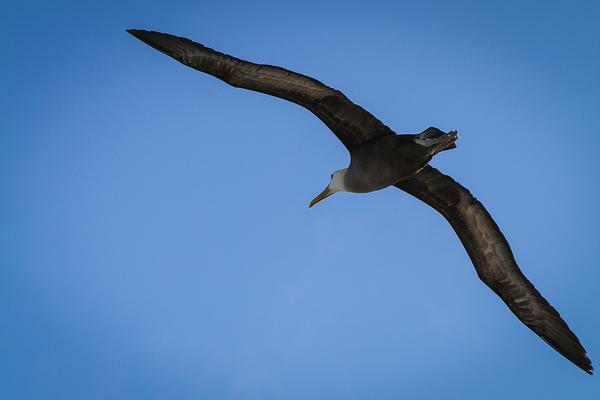 A waved albatross swoops overhead, playing in the thermals off of Espanola’s cliffs. Also known as the Galapágos albatross, the waved albatross is the largest of the Galapágos birds with a massive wingspan of 7–8 ft (213–43cm) and weighing 7–11 lbs (3–5kg). On the ground they walk with a waddle and appear to be very clumsy, but in the air they are extremely graceful. Like other birds that primarily glide, the waved albatross relies on strong headwinds to be able to take off. Waved albatrosses are extremely loyal birds. When a male finds a female mating partner, they will stay together and raise their chicks until one of them dies. Where to find them: The waved albatross is found only on Espanola, where they congregate in two major colonies. However, there have been sightings of non-breeders and therefore possibly small numbers (around 10 to 20) of breeders on Genovesa Island and Isla de la Plata. 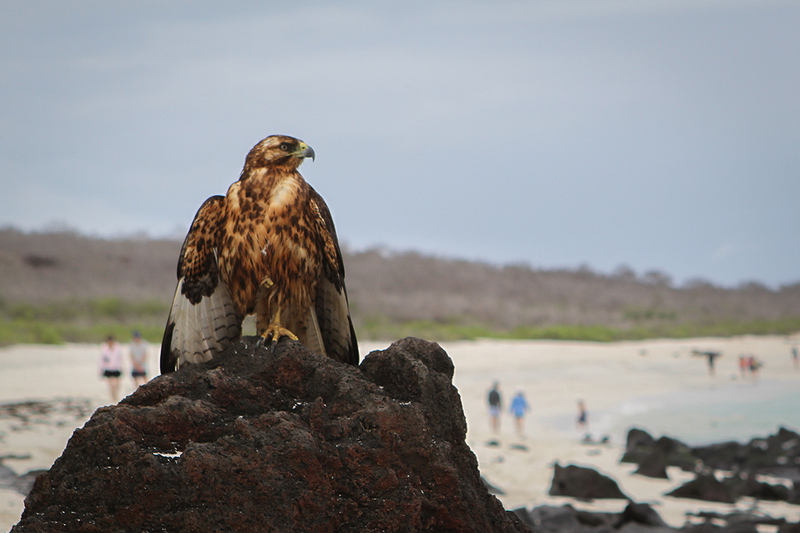 A Galapagos hawk perched above the beach on a bluff—a fearsome predator and scavenger with no natural enemies. The Galápagos hawk will take what it can get, delighting in a number of foods, especially baby iguanas, lizards, small birds, dead goats or sea lions—and will even stay steadfast over newly born pups to scavenge sea lion placenta. It can often be seen flying or perching impatiently near a nesting area of sea lions, in December, when sea lion pups begin to emerge. Where to find them: The Galapágos hawk is found in all types of habitat on the archipelago, including lava-fields, shoreline, forest and mountains but can be best viewed at Punta Suarez and Gardner Bay (Española), South Plaza, Santa Fé, and Punta Espinosa (Fernandina). Happening upon an inquisitive swallow-tailed gull. 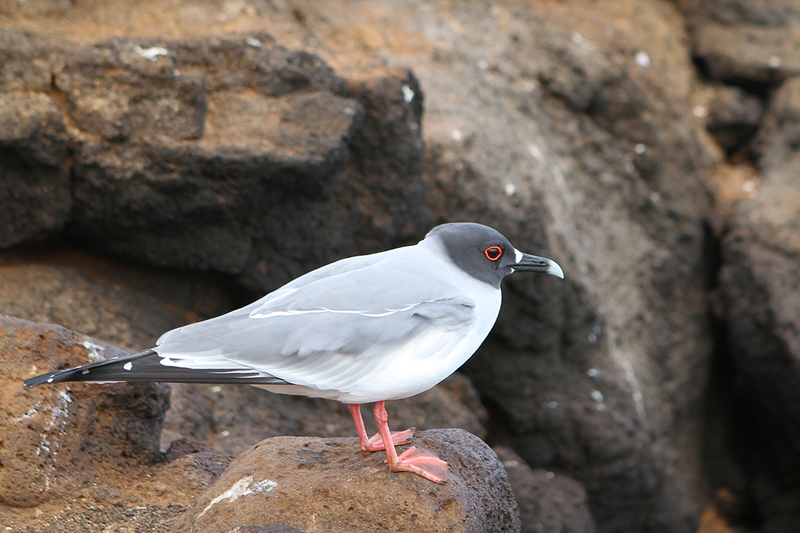 The swallow-tailed gull is the only fully nocturnal gull and seabird in the world. It preys on squid and small fish that rise to the surface at night to feed on plankton. During breeding season, the adult has a black plumaged head and is notable for the bright red fleshy rim around each eye. Where to find them: The best places to see the swallow-tailed gull are on the rocky shores and cliffs of Hood, Tower and Wolf Islands, with lower numbers on most of the other islands. It’s more common on the eastern islands where the water is warmer. Come to Seymour Island to find this iconic creature. Blue-footed boobies may be one of the most iconic birds in the islands, and for good reason. You will have a number of opportunities to see them hanging out in different coastal environments around the archipelago. They aren’t hard to spot, thanks to having no natural predators, which is why they nest on the ground and spend a lot of time on land. Their name comes from the Spanish word bobo, which means fool or clown. It was a name given either because these birds aren’t very graceful on land or because they’re perceived as fearless around humans. 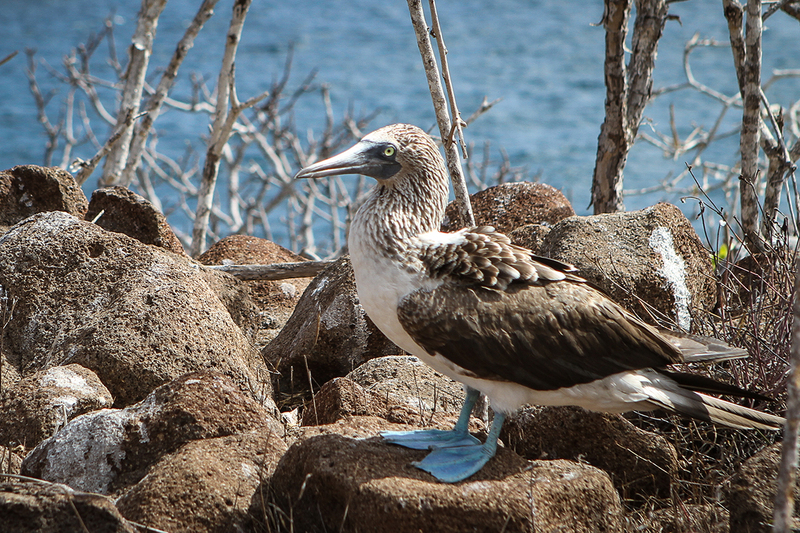 Where to find them: Seymour Island is one of the Galápagos’ best breeding grounds for seabirds. Blue-footed boobies are so common that visitors have to be careful not to step on any of the nests that may have been built on the trails. G Adventures runs a number of departures to the Galápagos Islands encompassing a wide range of departure dates and activities to cater for different tastes. We’re thrilled at the prospect of showing you this big blue planet of ours. Check out our small-group trips here. Grab a spot of sand and watch the sun set on Venice Beach. Our traveller community show off their best animal 'grams.